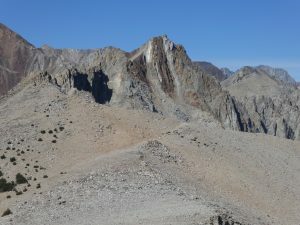 Perkins and Colosseum are two SPS peaks at the southern end of a wall of chossy peaks along the Sierra Crest between Taboose and Sawmill Passes. They were the last of these peaks I had not climbed, having reached the northern ones via Taboose in previous years. All of these peaks are more easily climbed from their gentler western sides, but that requires a roundabout approach. A more direct approach is possible up seldom-used Armstrong Canyon, which we had used to reach Mount Cedric Wright during the Sierra Challenge several years ago. Starting at the oasis of Scotty’s Spring around 5800′, a rough jeep road climbs past some old mines to around 8500′. Beyond, easy cross-country leads to the head of the valley around 10,400′, from which various loose chutes lead to the crest around 12,000′. Not expecting a long day, I took my time and started around 7:00, hiking the jeep road as it switchbacked past a quartz mine to a junction. I almost made the same mistake some of us made last time, but looked at my map and took the middle branch, which makes a flat traverse into the mouth of Armstrong Canyon. Beyond the end of the road, I boulder-hopped up the left side of the canyon, then took a use- or game-trail right of the boulders. Where it flattens out, I moved over to the right, planning to exit that side to Perkins’ north ridge. 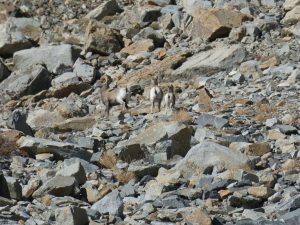 Entering the open bowl below Perkins’ colorful east face, I saw three bighorn sheep at a distance. Unlike the ones in the Pecos, which refuse to give ground, these seemed to be the shy desert variety, and ran behind a ridge soon after they saw me. The climb to the crest was more or less the loose slog I expected. I finally emerged on the east ridge of 12,482′, just north of Perkins, where I found a cairn. The ridge south was broad and easy down to the saddle, but looked narrow and rotten beyond. There was a bit of tricky climbing through some notches, but it was mostly not so bad, and I was soon on top. To the northwest were colorful Crater and Pinchot, on either side of Pinchot Pass. 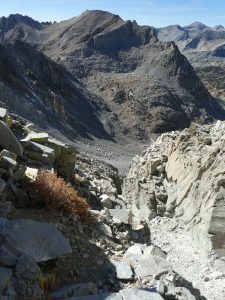 To the southwest, the JMT descends the broad, U-shaped valley of Woods Creek. 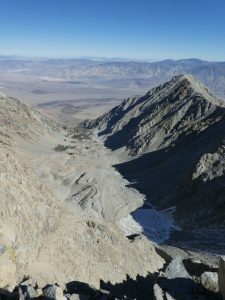 East, I looked down Perkins’ sheer face and the rock glacier below to the Owens Valley desert where I had started. The ridge to Colosseum looked long and slow, and I thought about dropping down to the valley west. However, the ridge was much easier than it looked, with fairly easy travel over the two bumps south of Perkins, then a quick talus descent to the broad saddle north of Colosseum. The climb to Colosseum started as an easy talus climb, then got a bit trickier toward the top. First, I found myself confronted by the steep gash mentioned in Bob’s trip report, extending far down the west face. I found a third class downclimb to the east, crossed the notch, then traversed a narrow ledge back out the other side to the west. Beyond the gash, Colosseum has three summits, the register being on the farthest, which does not look like the highest. I climbed over the first, traversed east around the second, then hiked across the sand and talus to the final one, finding the register canister hidden among some rocks. A recent entry claimed to have measured one of the other summits to be 40′ higher. It was comfortable overshirt weather out of the wind, so I hung out and checked my email, then headed back. I was severely tempted to drop straight down Division Creek, which has an easy entry and leads right back to the trailhead. However, when even Bob describes something as a severe desert bushwhack, I know it must be a nightmare. I also remembered the descent back into Armstrong being unpleasant, but I’ll gladly take sketchy scree over desert brush. I backtracked to the southern head of Armstrong Canyon, then took the first chute that seemed to go. 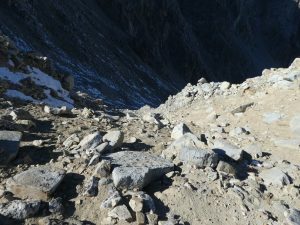 It was every bit as miserable as I remembered, with a bit of skiable scree mixed with treacherous hard-packed dirt. I made my laborious way down, then crossed a small permanent snowfield, and was at last on easy talus. 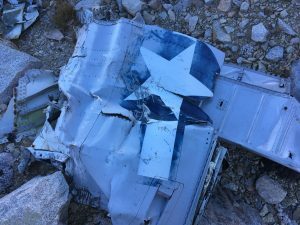 Just below the snowfield, I found the military plane wreck I remembered from last time. I wondered if the pilot had flown into the mouth of the canyon, then become boxed in by the steep, narrow sides and headwall. I took some more photos, then boulder-hopped across the canyon to rejoin my path from the way up. I was hoping to take the game trail I had found next to the boulders, but missed the crossover to the right side of the canyon. Still, it was easy going back to the road, then a fast, pleasant jog to the car. I washed up, then drove a demoralizing 1300′ back down into the desert to my next trailhead, Sawmill Pass.